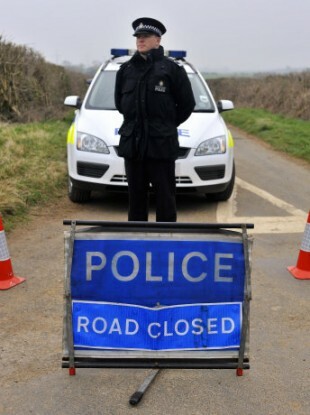 A policeman pictured near the site where the two bodies were found in Gloucestershire. UK POLICE HAVE named the woman whose remains were found near the site where Sian O’Callaghan’s body was dumped in Eastleach, Gloucestershire last month. She was identified as Becky Godden, from Swindon, who would have turned 29 years old yesterday, BBC News reports. Miss Godden is believed to have gone missing eight years ago and was reported to the national Missing People’s Helpline in 2007 by her family. It is reported she became ‘disconnected’ from her family and when they became concerned at the lack of contact from her, they reported her missing. The identity of the second woman was discovered after officers developed a DNA profile from bones that were recovered from Eastleach in Gloucestershire. Police are now appealing to anyone with information about Miss Godden to contact their local police or Crimestoppers in the UK. The body of Sian O’Callaghan was discovered on 24 March, days after she was reported missing. Taxi driver Christopher Halliwell has been charged with her murder. Email “Police name second woman whose remains were found in Gloucestershire”. Feedback on “Police name second woman whose remains were found in Gloucestershire”.